John Turturro’s “Romance and Cigarettes” is a heaving, throbbing, unholy mess of a movie. It is lovely in places, hilariously profane in others – but getting to the good parts is a bit like digging for diamonds in a dung heap. “Romance in Cigarettes” was completed in 2005 and played all over Europe that year, but didn’t reach U.S. screens till late in 2007. According to Andrew O’Hehir’s breathless, glowing review on Salon, that’s because the purported American distributor just didn’t know how to market it or didn’t trust American audiences to get it. Maybe. Or maybe it’s just that the movie is weird, sloppy and ill-conceived to the point of being almost unwatchable. James Gandolfini is a Queens steel worker named Nick Murder, and Susan Sarandon is his exasperated wife, Kitty. As the film opens, Kitty confronts Nick with a scrap of paper she’s found; it contains a poem he’s written to his mistress, lovingly extolling his favorite part of her anatomy. A heated exchange ensues, then Nick steps outside, music swells on the soundtrack, and he begins lip-synching to Engelbert Humperdinck’s “A Man Without Love,” soon joined by other men in the neighborhood – from sanitation workers to boys on bicycles. And so, as in earlier films “Pennies From Heaven” and “The Singing Detective,” we enter a world where characters express their deepest, truest emotions through lip-synching to their favorite songs. Later, we will see Kitty pouring her heart out in a sing-along to Dusty Springfield’s “Piece of My Heart.” It’s never entirely clear in what time period “Romance and Cigarettes” is intended to take place. A scene set in an Agent Provocateur lingerie store would indicate the present day; the character’s clothes have a downmarket ’80s feel, while the cars they drive appear to be from the late ’60s or early ’70s. But the music is definitively 1960s, all overheated pop ballads by the likes of not only Springfield and Humperdinck, but Tom Jones, Vikki Carr and others of their ilk. Although set in a grimy, working class neighborhood, there’s not much realism in “Romance and Cigarettes.” The characters have BIG emotions and they’re expressed in over-the-top ways: frantic, badly choreographed musical numbers; wild flights of dialogue; and shameless mugging. It’s hard to watch at worst, and hard to follow, at best. –Kate Winslet as Gandolfini’s foul-mouthed mistress. Hilarious and touching by turns, nearly unrecognizable under a mop of red hair and sporting a Manchester accent thick as clotted cream, Winslet very nearly steals the movie. –Elaine Stritch as Gandolfini’s mother. The grand dame of Broadway musical theater has only one scene, and one potentially wacky/unsavory monologue, but she invests it with so much genuine woundedness and bewilderment that the whole cockamamie movie slows down and you become absolutely transfixed by her. –The final few scenes of the film. Up to this point, it’s all been over the top and fantastical, but in its final moments, “Romance and Cigarettes” suddenly offers a quiet and wistful reflection on the few things that have been good in Nick and Kitty’s long and troubled marriage. The very last scene will you have all choked up. –Eddie Izzard. He isn’t bad, actually, he’s just criminally underused. As the local priest, his role is barely more than a cameo. One wonders if some good Izzard scenes were left on the cutting room floor. — Nick and Kitty’s daughters. Two of them are played by Mary Louise Parker and Aida Turturro. Need I mention that these two women are far too old to be James Gandolfini’s daughters? There are hits of sass and subversion in Parker’s brief appearances that almost distract you from the fact that she’s actually over 40, but there are no such compensations in Turturro’s performance (see The Ugly below.) Mandy Moore is their third sister, and she isn’t given enough screen time to make any kind of impression. The three of them spend a lot of time playing “rock band” in the back yard (with actual instruments and teenage-girl-like enthusiasm), a spectacle that isn’t particularly enjoyable to behold. –Bobby Canavale, as a neighbor who is briefly engaged to Moore. I had no idea what this character was supposed to be, other than a neighborhood boy who likes to sing along with the sisters’ rock band. He’s a embarrassing cartoon. –Most of the musical numbers. I’m not asking that Turturro pretend he’s directing “Chicago.”But even when the “dancers” in a musical number are garbage men working on the street or a gaggle of pregnant housewives walking by, the number needs a focus, a sense of the flow of the dancer’s movement and a director who knows where to point his camera and when to cut. Tuturro’s numbers (choreographed by Tricia Bourk) are choppy, unfocused and all over the place. You’re never sure what or who you’re looking at, or why. 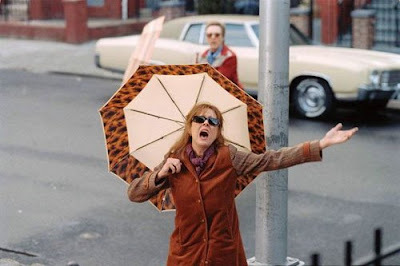 Woody Allen’s “Everyone Says I Love You,” where incidental characters like hospital workers and jewelry store clerks would break into a dance on cue, is the obvious (and far better done) precursor of this type of musical, and Turturro might have done well to take a good look at it. — Aida Turturro’s performance. She’s the director’s cousin, he should have done better by her. We’ve already noted that’s she far too old to be playing a teenager, and her apparent technique for playing younger is to play deranged. Ms. Turturro has two featured monologues – one delivered to Kitty in which she says something about Kitty not being her real mother; don’t ask me, I couldn’t understand a word. She also dictates something into a tape recorder late in the film -again, couldn’t tell you what, couldn’t understand a word. And it wasn’t a volume problem with the DVD player. Eveyone else was coming in loud and clear. I know Aida Turturro can act – I’ve seen her Janice Soprano – but I’m not sure what she was supposed to be doing here. The final word? I had originally planned to drive down to Champaign later this month to see “Romance and Cigarettes” at Roger Ebert’s annual Film Festival (read the post on Ferdy on Films) , where the screening will include an appearance by Aida Turturro. As you may have already guessed, I’m very glad I stayed home and watched it on On Demand from the comfort of my recliner. My best friend went to see this when Turturro was personally taking it around the US for screenings, since nobody would distribute it for him. She caught a screening in Chicago that had a Q&A with Turturro afterwards. She loved it. I remain skeptical, but will eventually check it out on DVD. Oh, and said friend is moving to Champaign next month. Hi Mrs. Thuro!Yes, apparently many people love this film – I certainly found a number of positive reviews online. I don’t get it. Maybe it’s because I’m a lover of more conventional musicals. Hey! I use the ‘good, bad, and ugly’ method, too! Sometimes… Okay, so I’ve done it twice. Nick – Let me then give credit where credit is due. Perhaps your use of “the good, the bad and the ugly” stayed with me subliminally after reading your blog. Got to admit it’s an efficient way to sum up a movie’s strengths and weaknesses.